I worked on this card as well as the one last week, I guess I have kind of been in a girly mood lately as my cards are flowery and I've been using pinks and purples. I need to maybe make some more masculine cards.... that should be next on my list I think. 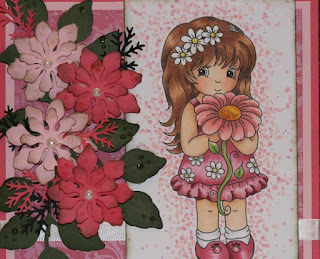 This card was made with a image from Miss Daisy Stamps called Daisy Girl. Daisy girl also comes with a bonus file. Check out the Miss Daisy shop for some fantastic images to create with . A closer look at Daisy Girl. Your girly moods are creating gorgeous cards, Charlene. I love the pinks with your Daisy Girl creation. The flowers to match are beautiful. Fabulous shadings and highlights with your colouring. Love, love!!!! !